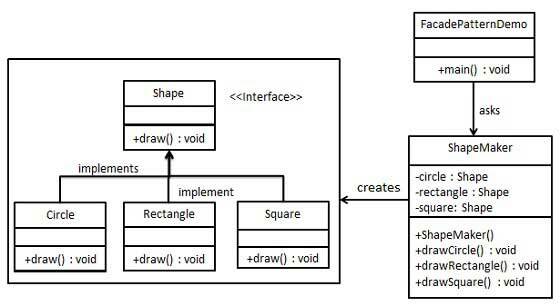 We are going to create a Shape interface and concrete classes implementing the Shape interface. A facade class ShapeMaker is defined as a next step. ShapeMaker class uses the concrete classes to delegate user calls to these classes. FacadePatternDemo, our demo class, will use ShapeMaker class to show the results. Use the facade to draw various types of shapes.